This is a big watch. Big battery, big rugged looks and a big long list of multi-sport features that’ll give almost any other watch a run, ride, swim or stand up paddle board for its money. 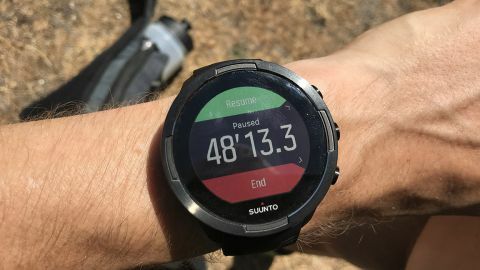 It’s expensive and the app and interface could use some work, but the Suunto 9’s epic staying power eclipses all of those frustrations. If you’re into adventure sports and endurance there aren’t many brands that cater for your tracking needs like Suunto. Rugged, robust and multi-sport talented, Suunto watches are built for doing battle with the big outdoors. The latest addition to the family, the premium Suunto 9, takes this to new levels. Equipped to hold its own even on the most extreme adventures, it’s got one major feature that will make runners of all levels sit up and pay attention – a battery life that will outlast even the longest endurance challenges. Ask any runner what’s on their running watch wish list and we guarantee that battery life will be somewhere near the top. While other watches like the Garmin Fenix 5 boast long battery life (48 hours in UltraTrac mode), this tends to be achieved by switching the power settings to low-energy and sacrificing some GPS tracking accuracy. That’s not the case with Suunto. The Finnish company claims to have cracked this problem, offering a watch with an incredible 120 hours of sport tracking with sensor-supported GPS tracking that’s just as accurate as many watches in full GPS mode. At least that’s the claim. But this isn’t just a one-trick watch, alongside that standout battery life there’s a range of features covering everything from the fluffier end of fitness such as sleep and activity tracking, right through to performance tracking in 80 individual sport modes, including running, trail running, cycling, mountain biking, pool and open water swimming, triathlon, obstacle racing. We could go on. There’s optical heart rate, barometric and GPS altitude, interval training, training load and recovery time recommendations, and all this tech has been through rigorous drop, freeze/thaw, humidity and immersion testing. In short, the Suunto 9 is built to go into battle with you during the daily grind and pretty much any extreme adventure you can dream up. On paper it’s a hugely capable tool, but with a hefty £499/$599/AU$899.99 price tag, does it stand up to these lofty aspirations? We took the Suunto 9 into the wild to find out. The Suunto 9 is out now in the UK, US and Australia, but it's not cheap, coming in at £499/$599/AU$899.99, a price that puts it in competition with the likes of the Garmin Fenix 5, but a bit below the Garmin Fenix 5X and Garmin Fenix 5 Plus. The Suunto 9 is unmistakably a Suunto with that familiar chunky, armored feel to the overall look. It comes in two colors: black with a slick-looking brushed dark metallic bezel and white with a brushed aluminum bezel. Both boast a smart look with a premium style that could pass as an everyday timepiece, though with an adventurer edge. We tested the black version. There’s a large sapphire crystal display that can withstand the knocks and scuffs a watch like this is likely to take. Though the 320 x 300 color touchscreen doesn’t fill that whole space, it’s plenty big enough to display up to five in-session stats at a time at a size that’s easy to read and presents numbers and charts such as heart rate progression in enough detail for at-a-glance review. As you’d expect from a watch that’s all about being big on battery life, there’s manually adjustable brightness, a screen-saver style dimmer and auto power save settings that kick in when you move between power modes. But we found the screen quite hard to read in direct sunlight even set to 100% brightness. It also picks up fingerprints really easily and we found ourselves having to clean the screen all the time. The touchscreen is responsive, but we found it easier to use the Suunto 9’s three buttons for controlling the watch after workouts (the touchscreen automatically disables during activity), when the touchscreen got a bit fiddly with sweaty fingers – though this is a problem you get with pretty much all touchscreen watches. The screen auto dims when not in use to save power and you have to bring it back to life with a tap of the screen, there’s no Apple Watch 3-style lift to wake action here. It also dims during an activity and needs a tap or a button press to bring up the brightness. Unfortunately, because the touchscreen disables during activity, you’re forced to press buttons and when you do you end up scrolling to the next stats screen or worse, pausing a run. You can choose from eight different watch faces displaying various stats such as time, step count, sunrise and sunset and battery life. The 24mm silicone strap is wide, comfortable and feels unbreakable. There’s a decent amount of stretch that ensures a good fit for most wrists, even if yours falls between the 18 notches. However, if you’ve got small wrists there’s a big question mark over whether this will be a comfortable fit. The straps can be swapped thanks to a simple clip system but there’s a limited choice of straps that will work with the Suunto 9. At 81g, the Suunto 9 is 6g lighter than the standard Garmin Fenix 5 Plus but it’s still heavier than most running watches on the market. The extra weight is a trade-off that most runners will probably be happy to make for all the features and that epic battery life, though. When it comes to climate and conditions, according to the specs there’s not much that the Suunto can’t handle. It’s waterproof up to 100 meters and capable of operating at temperatures -20° C to +55° C / -5° F to +130° F. So that’s polar and desert endurance taken care of then.